Green Hellebore – Dig Delve – An online magazine about gardens, landscape, growing & making. 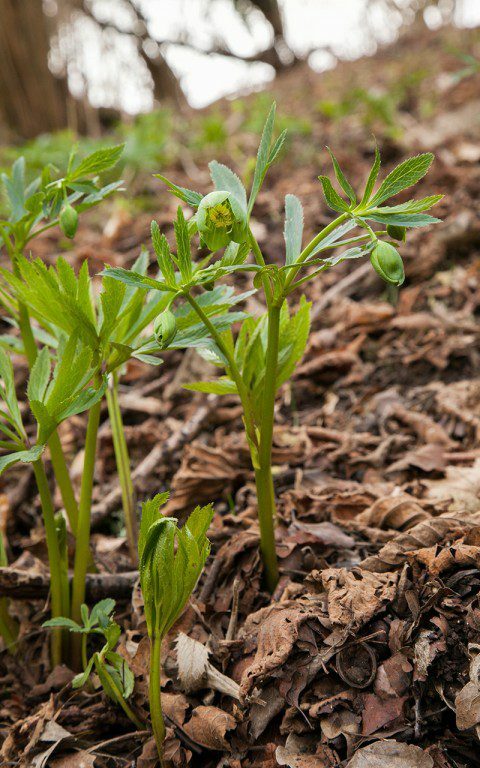 Not long after moving here, Jane, our friend and neighbour, took us for a walk into the woods in a nearby valley to see the green hellebore. We pulled off the lane and set off on foot along a well-worn way up into the trees. The north-facing slope had an inherent chill that set it apart from our south-facing slopes and the tree trunks and every stationary object were marked with a sheath of emerald moss. The track made its way up steeply into ancient coppice. Land too steep to farm and questionably accessible even for sheep. Fallen trunks from a previous age and splays of untended hazels marked the decades that the land had been left to go wild. At least wild in the way that nowhere is truly wild on our little island of managed land. I knew the woods, for we had been here before in summer to look at the fields of orchids that colonise the open grassland above, where the hill flattens out into fenced paddocks. 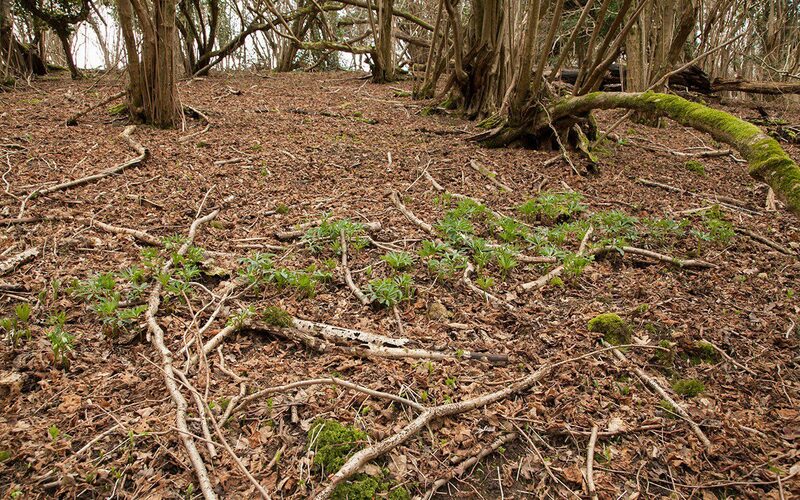 The woods are not extensive, but large enough to have their own environment in this steep fold in the land. Somewhere near the top of the hill, with the light from the field above us just visible through the tangle of limbs, we set off sideways onto the slopes. The angle was steep enough not to have to bend too far to steady yourself with your hands, but consequently required a firm foothold when inching along the contour. Deep into the trees we came upon our goal. Nestled in under the roots of ancient coppiced hazel and up and out with the very first catkins, the Helleborus viridis. To find a plant growing in the wild where it has found it’s niche is to truly understand its habits and requirements. Dry descriptions of habitats and associations in books instantly give way to a greater knowledge, for you never forget when you see a plant looking right in its place. 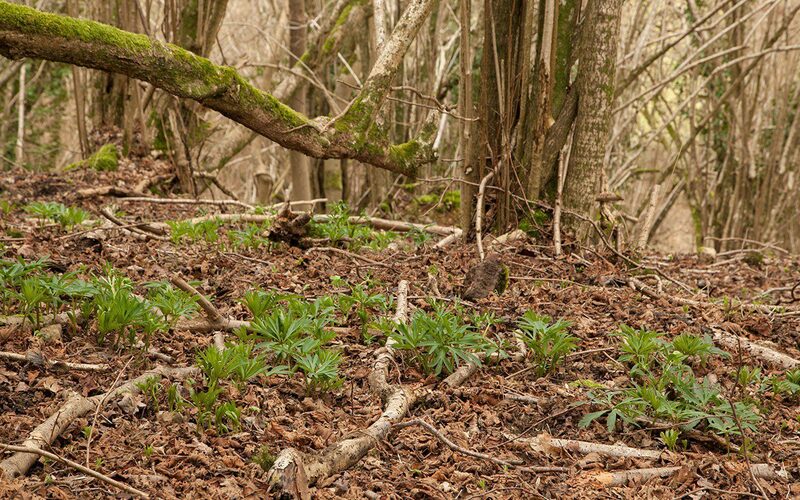 In the cool of the north-facing slope and shaded not only by the deciduous canopy above, but also by the bole of the hazel and its influence, the hellebore was at home. With no competition to speak of, protected by damp leaf mould and with its roots firmly holding in the limestone of the hill, it was king of its place. New foliage, soft and emerald green, splayed fingers of early life. The nodding flowers, concealing the stamens, held free of the ground foliage on arching stems. Viridis, meaning green, is the colour of all its parts; a welcome one at the end of a long winter and a sure sign that the season is ebbing. Several weeks later I returned in search of seed. The woods were flushed with first leaf which darkened the slopes. Nettles, already fringing the woodland edge where the light penetrated alongside the path, were ready to sting. 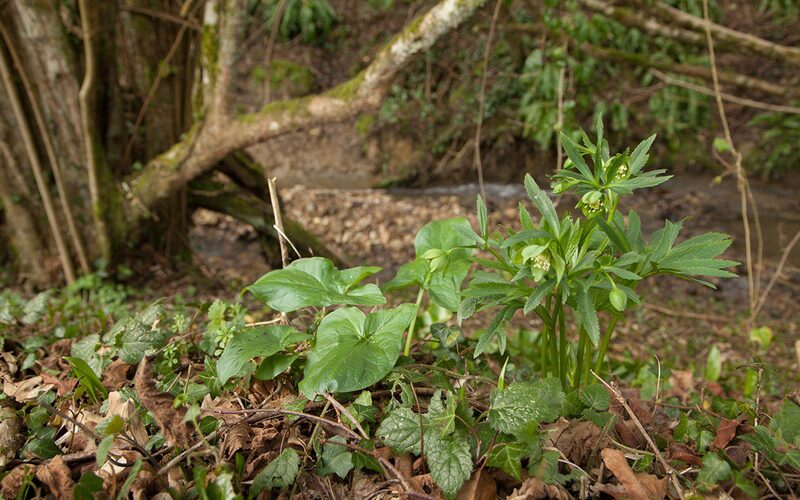 But deep where the hellebores were growing, they were still in glorious isolation with little more than a few celandine and wood anemone for company. The flowers were transformed, the lanterns replaced by a rosette of bladders which were just turning from green to brown. I cupped my hand underneath and tapped. A slick trickle of ebony seed settled into the crease of my palm. The seed of plants in the family Ranunculaceae is famously short-lived so I sowed it on the same day it was harvested, covered with grit and put in a shady place out of harm’s way. Three seasons later, the following March, it germinated with some success. I kept it in the shade on the north side of the house to throw its first leaves without disturbance. A year later I had seedlings that were ready to pot up and a year after that, to plant out. Jane took a number of the seedlings to start a colony on the north-facing wooded slopes that run up from our shared boundary, the stream. I planted the banks on our side, where the tree canopy provides the shelter, summer shade and leaf litter they need to do well. This year they are flowering for the first time in earnest and, with luck, will set seed and start spreading. Though they were once used for their purgative qualities (as a folk remedy for worms and the topical treatment of warts), Gilbert White pointed to the fact that it is toxic in all its parts. ‘Where it killed not the patient, it would certainly kill the worms; but the worst of it is, it will sometimes kill both.’ With this in mind, I have kept it away from the sheep and have noted that, even down by the stream where the deer have their run, it remains completely untouched despite its lush, early growth. Though rare in limestone woods in southern England, it is more common in parts of mainland Europe*. Cedric Morris found them in the Picos de Europa growing with a dark form of Erythronium dens-canis; a companion planting it would be hard to emulate here, because of the rush of growth that happens after snowmelt when everything comes at the same time. Its demure nature does not make it a match for the Lenten roses I have here in the garden, which feel rather opulent in comparison. However, I like it very much for its earliness, for its modest break with winter and particularly for the fact that it is native. Where my plants are establishing themselves amongst the newly emerging Arum italicum and an occasional primrose I find great excitement in the thought that spring is now unstoppable. 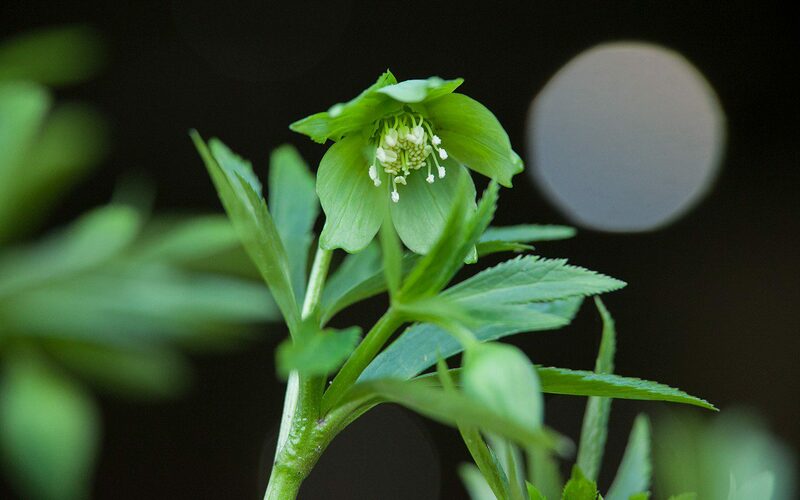 * There are two distinct subspecies of Helleborus viridis. H. v. ssp. viridis is found in S.E. France, Switzerland, N. Italy, S. Germany and Austria. H. v. ssp. occidentalis is the form found in Britain, Belgium, France, Spain and W. Germany.